To make a long story short, I’ve ordered chips from three difference China eBay sellers, and have received three different sets of chips that don’t work right. This one actually turned out to be an SP0256A-012. 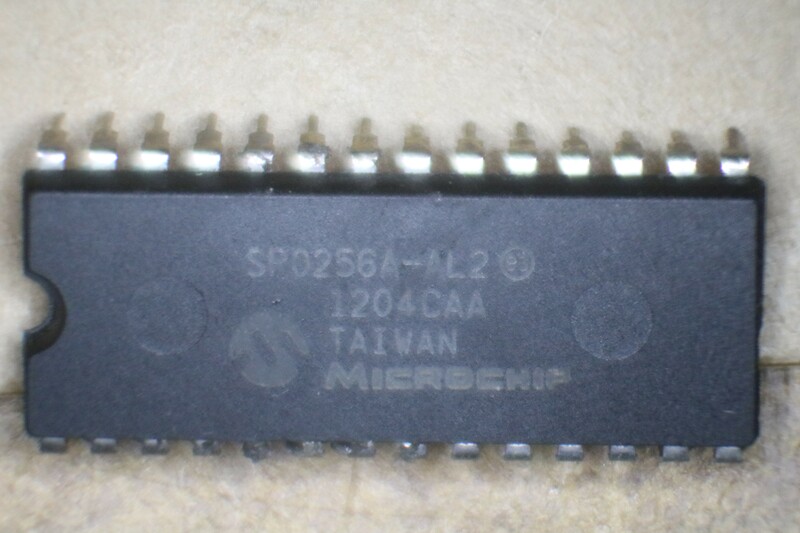 The -AL2 version of the chip is programmed with phonemes and is capable of synthesizing any word in the English language (maybe other languages too). The -012 is programmed with a fixed vocabulary for the Mattel Intelovision game console and has the phrase “Mattel Electronics Presents” as well as a bunch of digits (“one”, “two”, … “thirty”, “forty”, …). It might be handy for something like a clock, but is pretty much useless for any other purpose. I’m not sure exactly what happened, whether GI actually made these chips with the wrong print on them, or whether they were printed correctly and some entrepreneur figured he could make more money by reprinting them. Unlike the previous ones, these ones don’t output any speech at all. There is some noise that comes out of the output pin, and that noise varies according to what is on the address and data buses, even when the chip select input is not triggered. So it kinda makes annoying noise all the time. It also glitched my RC2014 so that it wouldn’t run (probably by outputting signals to the address, data, or control buses). 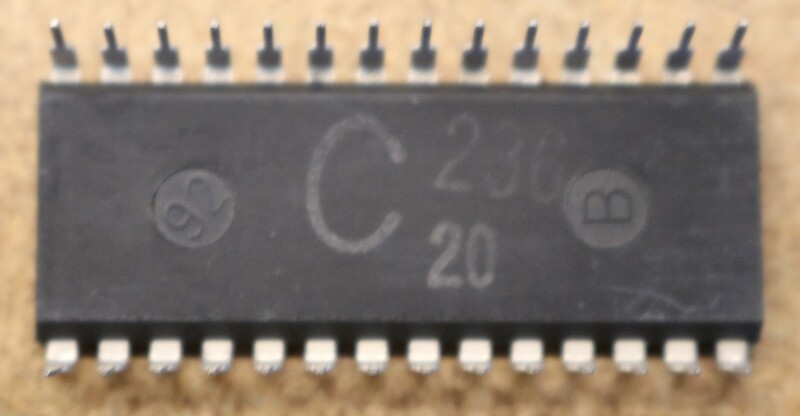 I suspect these are just some random 28-pin IC that someone reprinted. I suppose it would be an interested exercise to apply to signals to the fake chips and use a logic analyzer to try to figure out what it’s actually doing, and determine that the chips actually are. These ones appear similar to the second set. 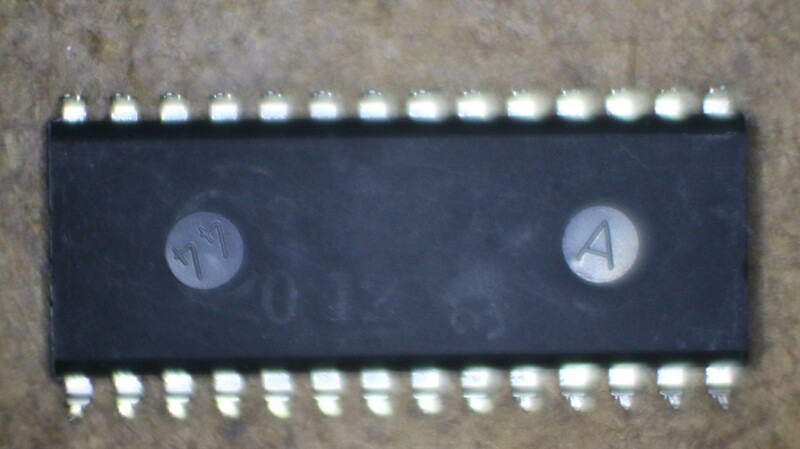 Same manufacturer marking (“Microchip”). The second line is 11263UK instead of 1204CAA. I’m not sure if that’s supposed to be a date code, or something else. Maybe someone who knows can let me know. In addition to generating weird noises instead of speech and glitching my RC2014 so that it wouldn’t work, merely plugging the cursed IC in seemed to damage two MC68B50 serial IO chips that I had in an adjacent slot on the RC2014. They’re just kinda wonky now. I suspect the fake SP0256-AL2 and the MC68B50 put conflicting outputs on the data bus at the same time, and this caused damage to the MC68B50. Maybe it damaged the fake SP0256A-AL2 as well. Who knows. The fourth set: GOOD CHIPS! 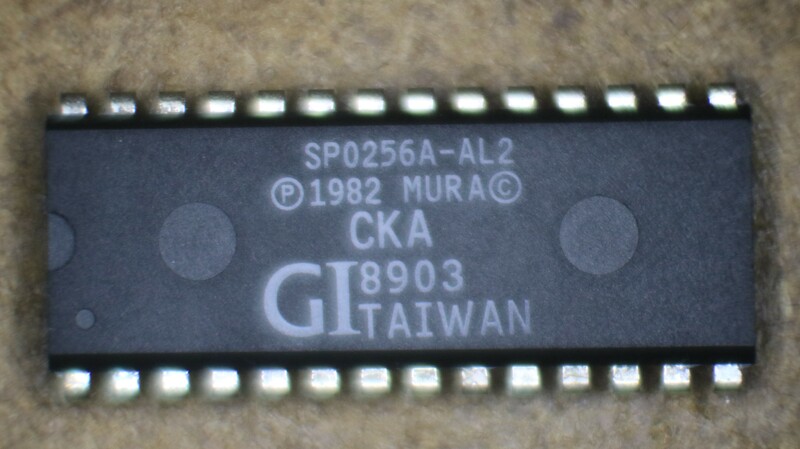 SP0256A-AL2, real non-counterfeit, non-fake, working chip! The good chips came from www.speechchips.com, and were priced at about thirty bucks each. I’ve tested them out in my RC2014 using my speech synthesizer board (blog post to follow soon) and they work fine, synthesizing the phonemes as expected. It’s cool to finally have some good ones, and finally be able to complete my project. speechchips.com is out of these at this time, but I’ve found some at http://sciencestore.co.uk/acatalog/Electronics.html . Here’s hoping the sciencestore chips are the real thing.